ROUSH's new 540RH™ Mustang features a 540 horsepower powerplant and has limited content. Also known as the Hammer®, this car comes armed with massive horsepower, a ROUSH® rear decklid spoiler, and short throw shifter with a choice of white or black ball, the 540RH™ is a stoplight slayer.Proving just how quick this car can be on the optional 18-inch Cooper RS3 tires, ROUSH engineers recorded an 11.8-second elapsed time at 121 mph during testing at Milan (Mich.) Dragway in early September. "The new ROUSH® 540RH™ is really intended to be a 'sleeper' car," Roush explained. "It will be purposely built with minimal content as it was designed for the buyer who wanted the ROUSH® horsepower but with a blank canvas that can be customized into their own personal one-of-a-kind ride. 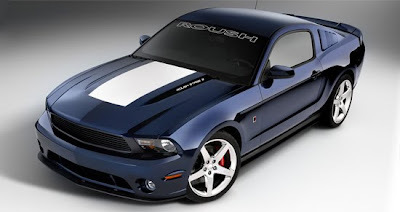 "The 2010 ROUSH® 540RH™ has a new suspension package which includes front and rear springs, front and rear stabilizer bars and jounce bumper, and a subtle tone-on-tone striping package. 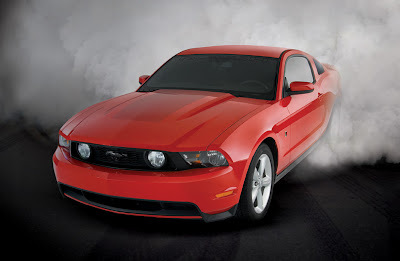 This vehicle uses the same engine that debuted in the 2009 ROUSH® P-51B™ Mustang. In order to get this type of power from the Ford 4.6L, 3-valve engine, ROUSH technicians replace many of the internal components with stronger parts including forged aluminum pistons (with an increased dish to lower the compression ratio from 9.8 to 8.6), forged steel H-Beam connecting rods and a forged steel crankshaft. The fuel rails are changed, as are the fuel injectors and an upgraded fuel pump. ROUSH® also upgrades the clutch and includes a custom-calibration for the ECM to manage the performance of the next-generation R2300 ROUSHcharger®.As is standard with all new ROUSH® Mustangs, this car will come with the anti-wheel hop kit installed during the assembly process. This part (No. 401788) is an outstanding addition to any 2005-2010 Ford Mustang GT.This vehicle is covered by a 3-year/36,000-mile warranty and will be available with a manual transmission only. The 2010 ROUSH® Stage 3™ Mustang once again takes its rightful place atop the hierarchy of Jack Roush's lineup. This vehicle packs a punch with 540hp and 510 lb-ft and is fully-loaded with the ROUSH® body components; resonator exhaust; four-piston front brakes with 14-inch rotors and painted rear calipers with slotted rotors; and the new upper billet grille which removes the fog lamps and streamlines the appearance of the new Mustang while improving cooling performance. Interior enhancements include ROUSH® leather seats with an embroidered Jack Roush signature; four-piece performance pedals; ROUSH® illuminated sill plates; short throw shifter with black or white ball; and a new interior Stage 3™ badge with the car's serial number engraved.The 2010 ROUSH® Stage 3™ Mustang rides on 18-inch chrome wheels with high-performance Cooper RS3 tires; 20-inch chrome wheels with Cooper RS3 tires are one of the few options available on this model. The suspension package includes ROUSH® front struts, rear shocks, front and rear springs, front and rear stabilizer bars and jounce bumpers. "The ROUSH® Stage 3™ Mustang has traditionally been among the halo vehicles of our lineup and I'm really proud that it sits atop the pecking order once again," said Jack Roush. "This new iteration of the Stage 3™ represents our highest horsepower and most sophisticated ROUSH® Mustang yet, and is sure to resonate among our fans. "The 2010 ROUSH® Stage 3™ Mustang will have a limited production run of only 103 vehicles.This vehicle uses the same engine that debuted in the 2009 ROUSH® P-51B™ Mustang. In order to get this type of power from the Ford 4.6L, 3-valve engine, ROUSH technicians replace many of the internal components with stronger parts including forged aluminum pistons (with an increased dish to lower the compression ratio from 9.8 to 8.6), forged steel H-Beam connecting rods and a forged steel crankshaft. The fuel rails are changed, as are the fuel injectors and an upgraded fuel pump. ROUSH® also upgrades the clutch and includes a custom-calibration for the ECM to manage the performance of the next-generation R2300 ROUSHcharger®.As is standard with all new ROUSH® Mustangs, this car will come with the anti-wheel hop kit installed during the assembly process. This part (No. 401788) is an outstanding addition to any 2005-2010 Ford Mustang GT.The 2010 ROUSH® Stage 3™ Mustang is covered by a 3-year/36,000-mile warranty and will be available with a manual transmission only.